This pesto combination is so delicious and creamy it takes pesto to the next level. You can have this stirred in to warm pasta (brown rice pasta is gluten-free and my preference) or slathered on toast. I’m really happy with this combination and know that you’ll find it so tasty and extra bonus points for it being incredibly nutritious. 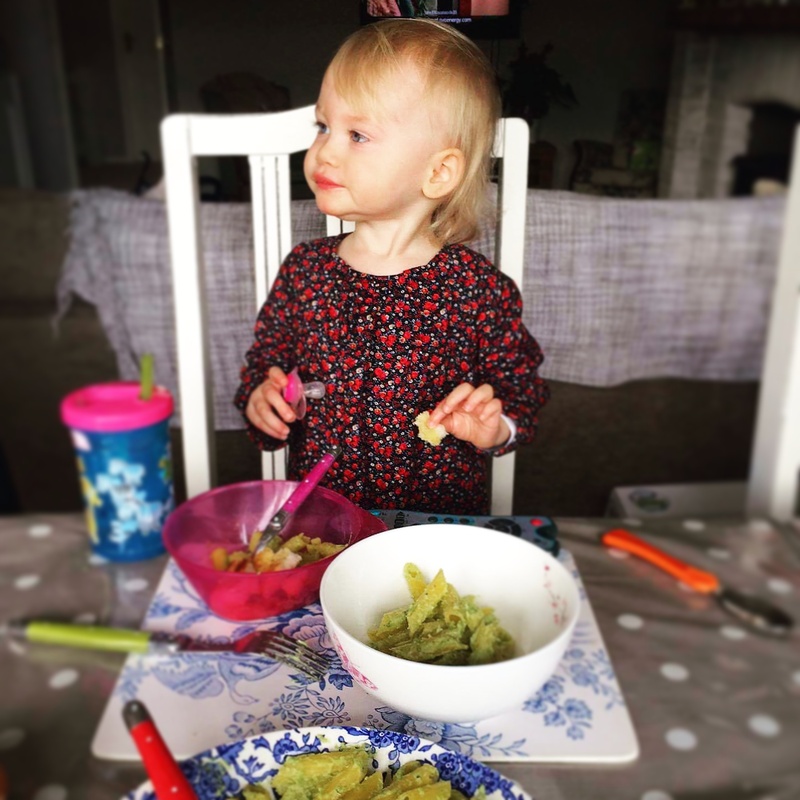 I tried and tested this recipe on two toddlers, a four and 7 year old, a teenager, another Mummy and a fussy health fanatic (Oli, my partner). I can honestly say that they loved it, yay! The 7 year old took some coaxing in to initially trying it but she got there and loved it. Place the pinenuts into the food processor and blend, once blended add the rest of the ingredients. Once evenly combined you can either serve immediately or place in an airtight container and store in the fridge (up to 3 days). Important things to remember when making your own food from scratch is that you know exactly what is going in to your food. With this recipe the peas will be providing you with a good source of omega-3 fatty acids, which reduce inflammation throughout the body. Peas are a great source of fibre and protein helping you maintain a healthy digestive system. Avocado contains vitamin A, B, C, E, & K, copper, iron, phosphorus, magnesium, and potassium – just amazing! They have a rich supply of a type of fat called oleic acid, also found in olive oil, which helps the digestive tract’s ability to absorb nutrients, as well as lowering the risk of heart disease. It’s so worth investing in a little home cooking, your mind and body will thank you for it. Remember that your body needs to last you quite a while!! This really is a warming, hearty, colourful dish to get you through February. Full of goodness it will help keep those nasty winter colds at bay and the vibrant colours and fresh flavours reminds me that spring is just around the corner! We all struggle with thinking of different things to make for dinner and tend to get stuck in a rut. Because I love good food, like to be inspired, and I’m nosey, I always ask people “what are you having for dinner tonight”. So – what are you having for dinner tonight? Healthy food doesn’t have to be boring, if you’re struggling for something different, or just need some inspiration, try this recipe. It’s so easy and all the ingredients get thrown into one pot, which means less washing up! I made this for just two people with a little left over, but Oli does tend to eat for five, so you could alter the quantities to suit whoever you’re cooking for. Start by chopping the fine beans, the corn and the tomatoes in half. Also chop up the onion, chilli and crush the garlic. Melt your coconut oil (or olive oil) in a large saucepan then add the turmeric, garam masala, chilli & crushed garlic until they’re bubbling. Add the fine beans, corn, and onion and stir the ingredients well. After a few minutes add the tin tomatoes and also the chopped fresh tomatoes. Once it’s bubbling turn it right down to simmer for about 15 minutes. Next you need to drain your chickpeas and add to your pot. Also chop up a handful of coriander and add to the mix. Leave to simmer for a further 15-20 minutes. Meanwhile, get your rice ready. The amount of rice you use is dependent on how many are eating. For the two of us I use one cup of rice to two cups of boiling water. Place the rice and water over a medium heat. I literally do the absorption method as it’s the only way I don’t mess the rice up. Literally leave on the heat until the rice has absorbed the water. Once everything is ready place the rice into bowls and the curry on top. On top of each curry serving I squeeze a little lemon over. Dollop a table spoon of natural yogurt on the top of your curry with a little more coriander sprinkled on top to serve. Then get ready to tuck in to a healthy dinner bursting with flavour and goodness!